Paul Barden Roses: 77-07-12: update. I have been so busy trying to keep up with the hundreds of tasks that all have to be done in May and June and regrettably, blog posts often get dropped from my "to do" list. Tonight, however, I will make an effort. This is one of about six selections I have now culled down to from the cross made in 2007 of ('Penny Ante' X 'Tradescant') X L83. The seed parent is a proprietary hybrid of mine that I often use for breeding to get both good color and vigor into my work. It turns out to have been an excellent choice with which to mate L83, the AgCan Kordesii breeder. Seedling #77-07-12 is my favorite of this group, with its heavy, dark glossy foliage and the 4" double red and purple blooms, reminiscent of a slightly less double 'Charles de Mills'. 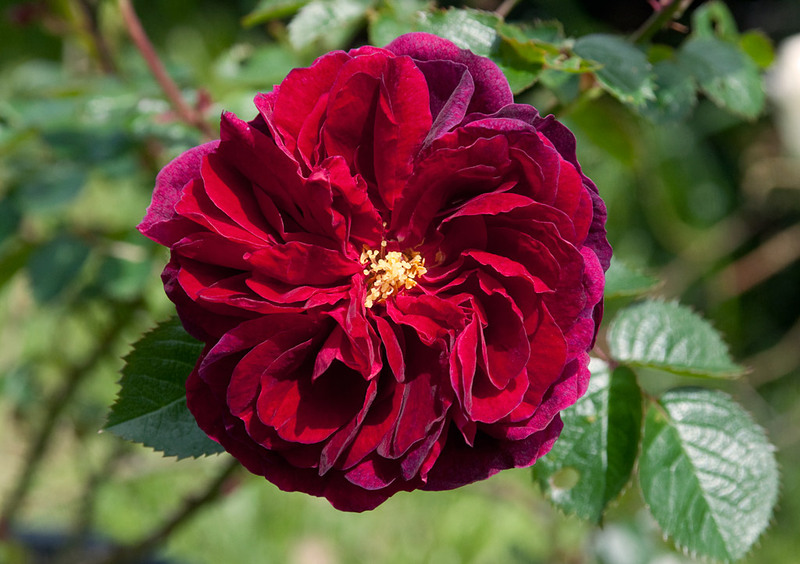 It has a modest "modern rose" fragrance that is neither strong nor remarkable, but pleasant just the same. The foliage has so far been completely immune to Blackspot, whereas other seedlings immediately next to it have lost 80% or more of their foliage to the disease. While I am considering this as a "finished" variety (IE: headed for market) I am also working on proceeding with it as a breeder, crossing it with its siblings and one of the yellow L83 hybrids, the idea being to improve further on the excellent disease resistance of these L83 seedlings. Brilliant. How would you estimate cold-tolerance? It is difficult for me to assess fully a seedling's Winter hardiness in my climate. However, I feel it is a good sign that my favorite selections from the various L83 crosses all survived the freeze of Winter '09 in pots, above ground and with no protection of any kind. None had any cane damage either. The same cannot be said for many Hybrid Teas, and Floribundas planted in the ground out in the garden; many of these had severe cane damage and some plants died to the ground. I lost every one of my Teas this Winter, with the exception of a couple living in greenhouses, and I believe a few canes of 'Niles Coceht' have survived. This year, the L83 hybrids are looking far more appealing to me as an important path to follow. Being in Zone 4b/5a, I will very selfishly agree! I can see lots of 'Tradescant" in it, but the colour is clearer to me, not as muddy, and the shape reminiscent of pinwheels...Bravo Paul Will this survive in Toronto winters, do you think it can take a bit of shade ? Unlikely that a rose of this type would tolerate much shade; this is a full sun plant, I'm sure. Many of the roses descended from L83 easily survive Winters to at least USDA zone 5, and some will do well down to Zone 2, but with dieback above the snowline. Without thorough testing its hard to say, but I'm certain this would do beautifully in SoOnt. Praise for one of my favorite roses.